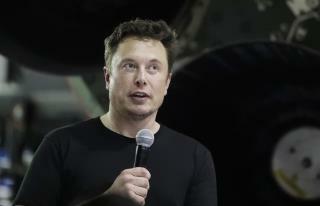 (Newser) – Tesla CEO Elon Musk has dismissed the idea that the company's new chairwoman can exert control over his behavior. Robyn Denholm, an Australian telecommunications executive, was appointed chairwoman of Tesla's board last month, replacing Musk as part of a securities fraud settlement with US government regulators. But Musk said "it's not realistic" to expect Denholm to watch over his actions because he owns about 20% of the electric car company, the AP reports. "It's not realistic in the sense that I am the largest shareholder in the company," Musk said in an interview with CBS' 60 Minutes, broadcast Sunday evening. "I can just call for a shareholder vote and get anything done that I want." His behavior isn't erratic, it's a little quirky, which might be expected from someone who is brilliant and original. He sees things differently than most of the rest of us. "Musk said. Amid its CEO's erratic behavior, Tesla delivered on promises to accelerate production of its pivotal Model 3 sedan and fulfilled a pledge to make money during the third quarter. Musk has said he expects the company to remain profitable." this article states. " Tesla has posted its first profitable quarter in two years, its third ever, thanks to the popularity of the Model 3 sedan. The automaker said on Wednesday that it generated $6.8 billion in revenue in the third quarter of 2018 and walked away with $311 million in profit — the most the company has ever made in a quarter." Oct 24, 2018 Tesla is not making "profits". Anyone that invest their money in Tesla is making a mistake. Can anyone speak of anything without bringing politics into it these days?